I pass Miss Marmalade a few times every week, and she is never empty. Miss Marmalade sure is a popular lady. I should know, because my own housemates love her farmhouse breakfast menu. Apparently they also do decent Eggs' Benedicts, so that's two choices I must try, there. I just found out they do breakfast cocktails. Seriously, who wants to go with me, right now? Definitely taking you here, M and A! 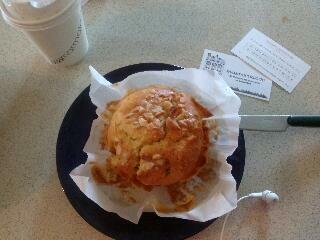 The one time I went into Miss Marmalade, I got a regular latte and a passionfruit muffin. Without lying, it was the most delicious muffin I have ever tasted in a long time. A huge muffin, too. I had half for breakfast and the other half for lunch.